Cool fabric at the Olde Time Fabric Shop. 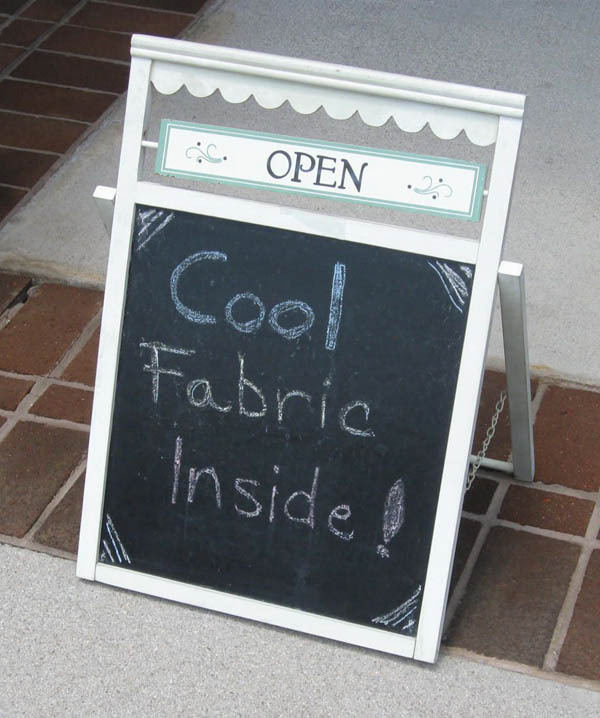 A sign announcing, "Cool Fabric Inside!" is a like an oasis in the dessert to a quilter during these hot and humid days of June... or any time of year, for that matter. I saw this sign propped up on the sidewalk outside the Olde Time Fabric Shop in Knoxville, Tennessee, and what I found inside did not disappoint. 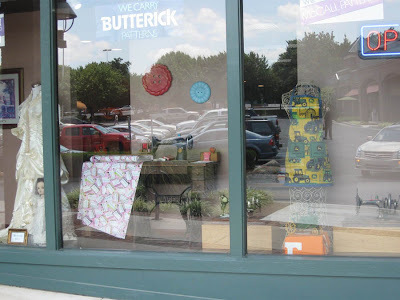 For a shop that just opened at the beginning of this year, Rebecca, the shop's owner, has stocked the shelves with a wonderful selection of quilting fabrics—including great blenders and basics such as Blank Quilting's Fusion Illusion, Splash and Spirals that complement her myriad focus fabrics. Threads, notions and patterns round out the selection geared toward quilters of any level. Rebecca, an avid sewer, also offers apparel fabrics and sewing patterns such as Butterick, McCalls and others as well as sewing notions. This shop's selection and ambiance is anything but "old time." 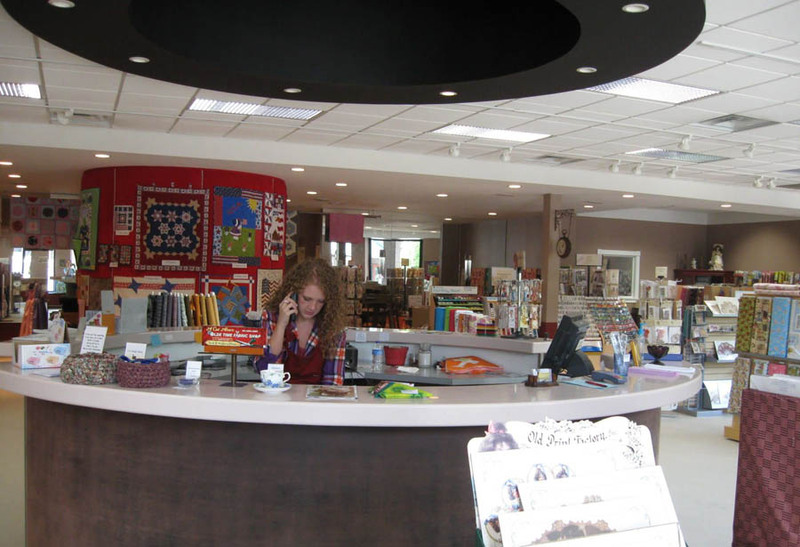 The circular customer service counter in the middle of the store provides a good vantage point for store personnel to greet, assist and direct customers and offers easy access for customer checkout. The space is open, comfortable and well lit. Brittney, Rebecca's step-daughter, provides customer service. During my visit, there was a store-sponsored contest going on. Small wall quilts with a patriotic theme were on display on the large round column behind the customer service counter. Stop in and vote for your favorite! Rebecca is also talking with prospective teachers and plans to offer a range of quilting and sewing classes in the near future. The shop has an easy-to-spot corner location in the Western Plaza Shopping Center. 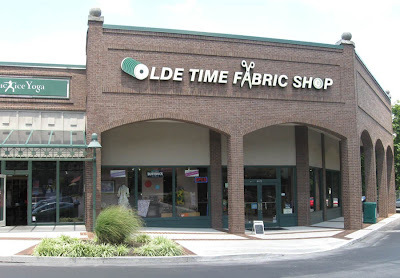 The Olde Time Fabric Shop is located in the Western Plaza Shopping Center in the Bearden area of Knoxville. The store's large outside sign and corner location in the shopping center makes it easy to find. There is plenty of parking and Fresh Market is located in the same center. Front winder of Olde Time Fabric Shop.